After the dissolution of the Workers Solidarity Federation (WSF) in 1999, there were a number of new anarchist initiatives. In Durban, Zabalaza Books and the Anarchist Union (later the Zabalaza Action Group, ZAG) were the most important. Durban activists linked to these projects also established a short-lived South African Regional Organising Committee (ROC) of the revolutionary syndicalist Industrial Workers of World (IWW). 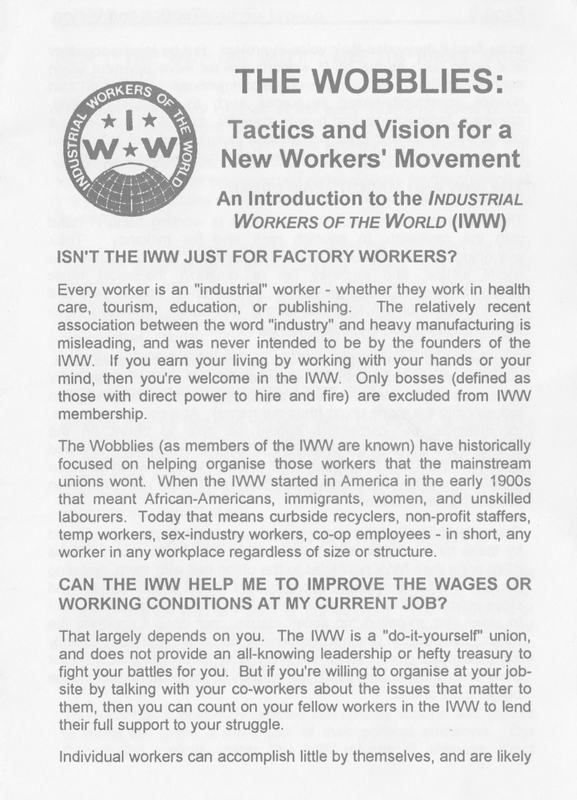 That is, the Durban-based IWW was formally linked to the main IWW in the United States. The Durban-based ROC did not have much success in forming IWW unions. Note: address details on second last page of the PDF. Note: A later attempt at a South African IWW, this time based in Cape Town, took place in the early 2010s, with similar results.